The Internet is a place where we can get details for almost everything. We are constantly in contact with our friends & relatives through social media. Here we are going to share 14 basic tips which can help you make better use of the internet. This is the world of rising technology and till the date, the technology has reached up to the great levels. Almost everyone is using the internet on their smartphones or computers. The Internet is a place where we can get details for almost everything. We are constantly in contact with our friends & relatives through social media. However, do you know there are few little tricks that can be crucial in making better use of experiences on the internet? 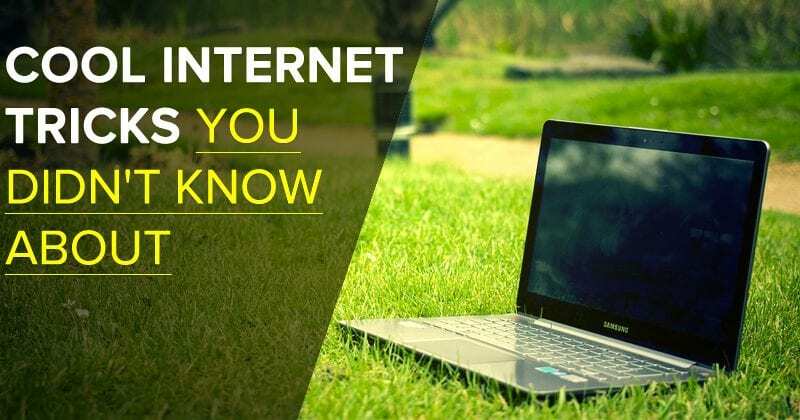 Here we are going to share 14 basic tips which can help you make better use of the internet. You need to right click on the Tabs and then select the option “Reopen last closed tabs” to open up the recently closed tab. However, You can also open your last closed tab by pressing CTRL+SHIFT+T. You need to right-click on the image and then have to select the option “Search Google for this image” to perform a reverse image search, which looks boring. However, you can Hold ‘S’ + Right Click on an image to perform a reverse image search. Gone are those days when users need to type the full URL of the web page to visit any site. Pressing CTRL+ENTER now adds .com to any word you time in the URL Bar. Users always choose to right click on an URL and then select the option “Open Link In A New Tab” to open link in a new tab. However, to make things simple, hold Down ‘CTRL’ and then click on the link to open the link in a new tab. Incognito browsing doesn’t record your browsing history. Users can press CTRL+SHIFT+N to open up an Incognito browser window. This shortcut works on Google Chrome and Opera. If you want to know which font was used in an image simply save the image on your computer and then go to WhatTheFont. Upload the image there and it will tell you the used font. If you need to scan some document and extract the text out of it, then simply visit the website Free OCR or Online OCR which will help you to extract text from any image or documents. Make sure to replace techviral.net with your domain name. If you want to clear the cache of the browser then just press CTRL+SHIFT+R. This will probably clear the cache of the opened web page. Well, there are times when we need to use a timer in hurry. You can use Google in emergency and it also eliminates the need for a third party tool. Just search Google Timer on Google search bar for a timer with alarm. Most of us visit a different song website to find and download our favorite music file. However, you can eliminate the need for extra searches just by using a simple Google dork trick. You can search intitle:index.of?mp3 Your song name here to get the download link. As we have already mentioned above, you can directly open a Notepad on your Google Chrome Browser. Another trick is to open Notepad in night mode which looks better. You just need to paste the following code in your Google Chrome’s URL bar to open Notepad in Night mode. Well, VLC media player automatically loads subtitle file if it was the same as movie name. So, you just need to rename the subtitle file same as movie name and keep in the same folder to load subtitle automatically. So, these are the ten basic tips which can help you make better use of the internet. These things can also save your precious time. Have something to add? Leave it in the comment section below.